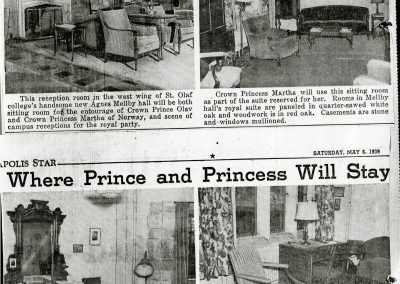 The first-ever Norwegian royal visit to St. Olaf College occurred on May 7 and 8, 1939, Crown Prince Olav and Princess Märtha and their entourage were billeted overnight in the newly constructed Agnes Mellby Hall. The entire first floor and part of the second floor were devoted to them. Dean of Women Gertrude Hilleboe acted as hostess and gave up her own living quarters to Märtha. Olav was given his own room within the dormitory. One month prior to the royal visit, Dr. Walter Judd, a longtime medical missionary in China, spoke at chapel. His address painted a vivid picture of Japanese military activities in beleaguered China. 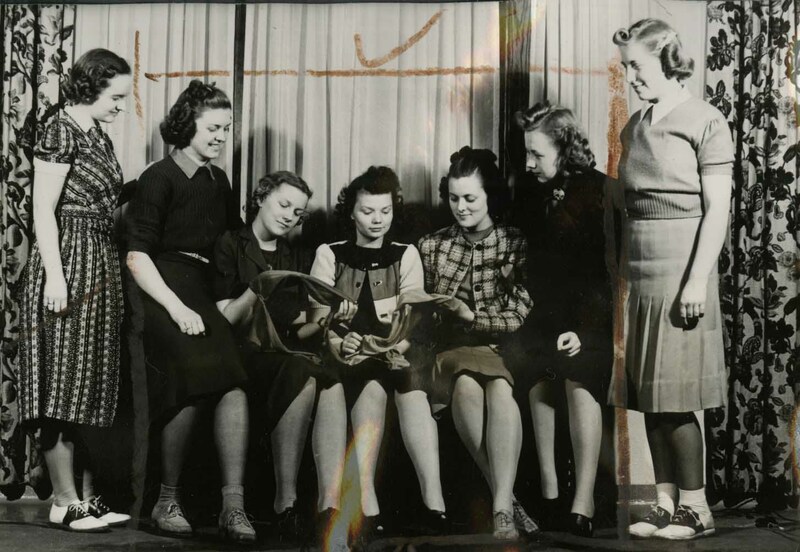 Within a week of his talk, 450 of the 505 women on campus voted to “do their part” and boycott Japanese products made of silk; instead, they wore cotton lisle stockings. Nylon was not yet invented. 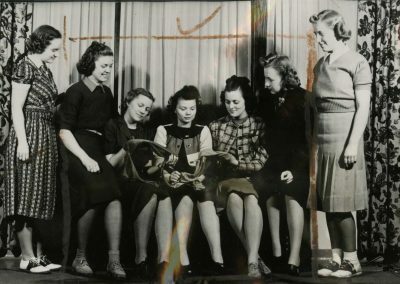 Fighting Japanese military oppression, 450 of the 505 women on campus voted to “do their part” and boycott products made of silk, wearing instead cotton lisle stockings. Nylon was not yet invented. 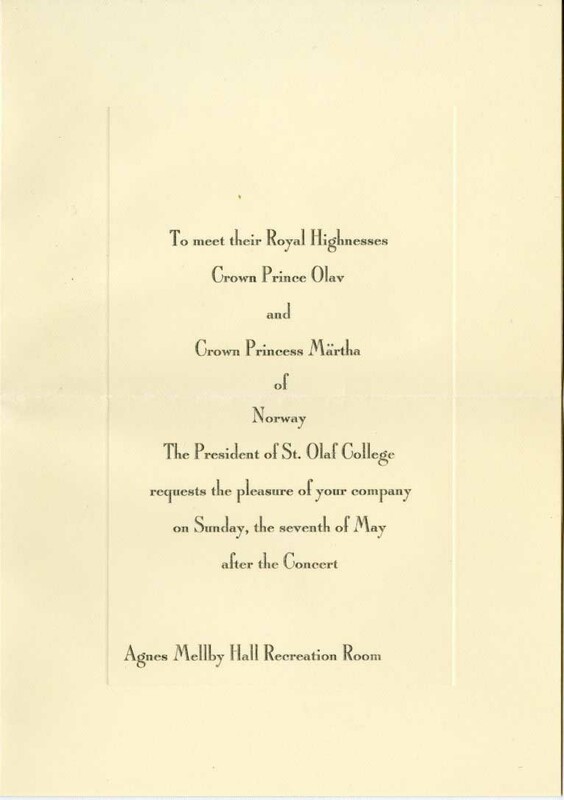 Invitation to meet and greet their majesties, Crown Prince Olav and Princess Martha, in Agnes Mellby Hall. The entire first floor and part of the second floor were devoted to the guests. 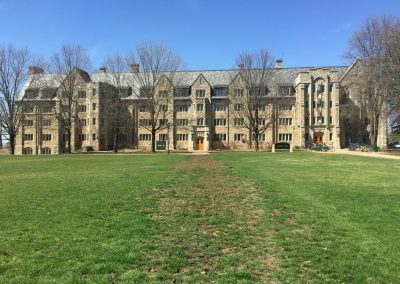 Dean of Women Gertrude Hilleboe acted as hostess and gave up her own living quarters to Martha. Olav was given his own room within the dormitory. 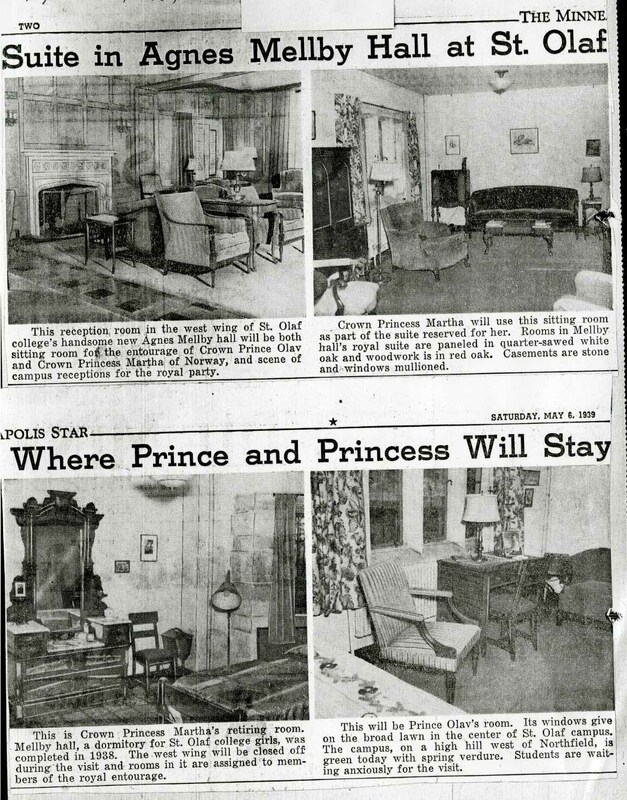 Minneapolis Journal, May 8, 1939. 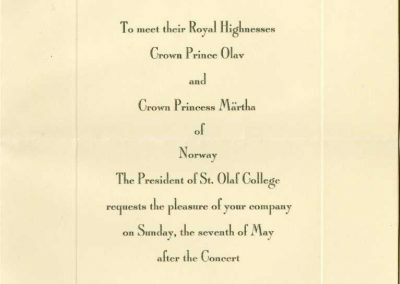 The first-ever Norwegian royal visit to St. Olaf College occurred on May 7 and 8, 1939. 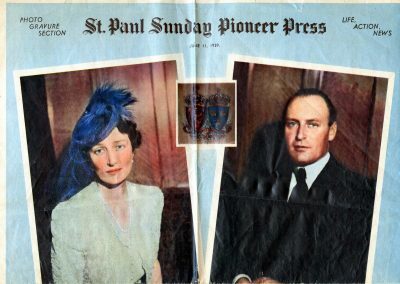 Photographs of Crown Prince Olav and Princess Martha were taken in Agnes Mellby lounge. 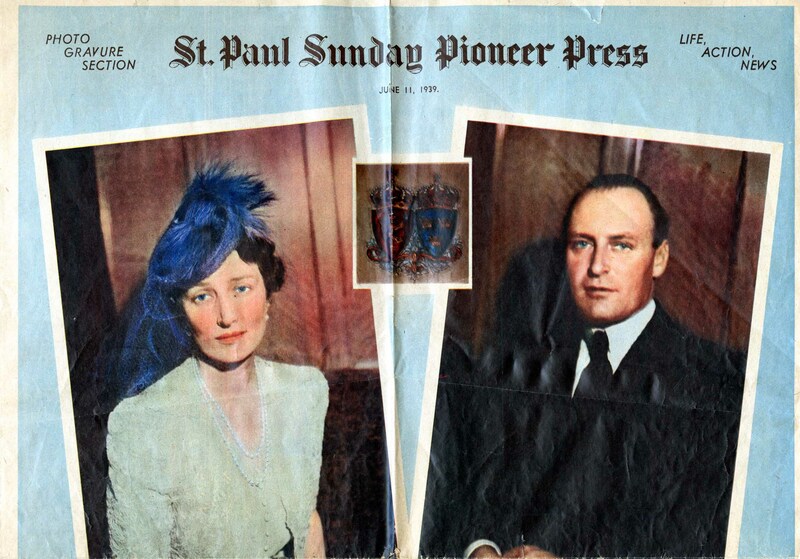 St. Paul Sunday Pioneer Press, June 11, 1939. 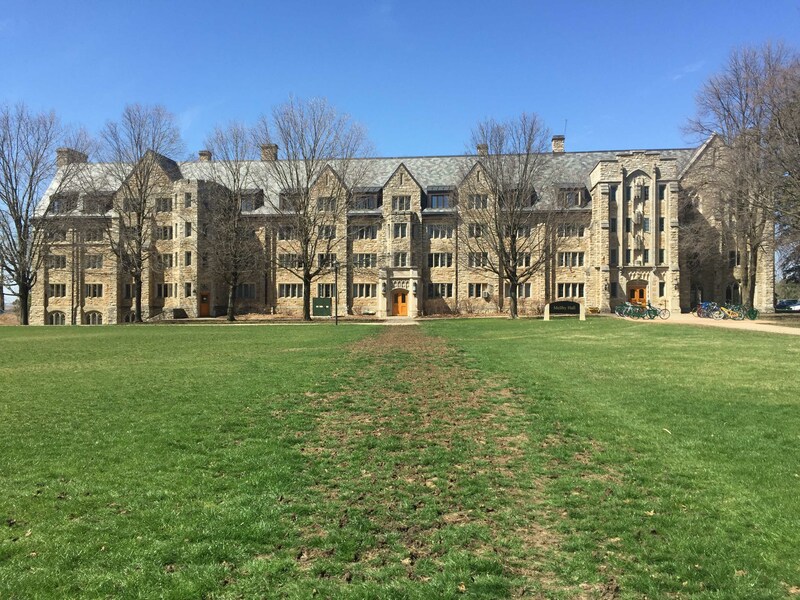 An outside view of Mellby Hall, the residential building the Crown Prince Olav and Princess Martha of Norway stayed in during their visit to St. Olaf in 1939. It is still in use as a residential building today.